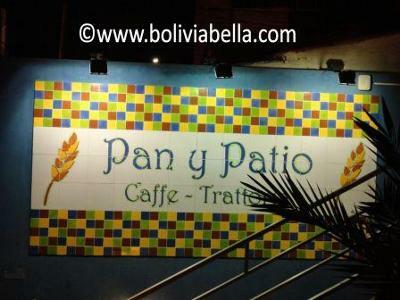 PAN Y PATIO (which literally means "bread and patio") is a pretty cool restaurant located on Rene Moreno street in the Zona Sur (southern end) of the city of La Paz, near San Miguel. 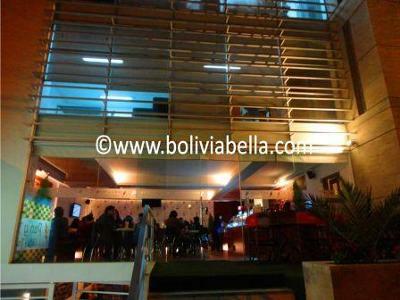 This 2-story mostly Italian-fare restaurant features a large and comfortable seating area downstairs and a smaller, more cafeteria-style seating area upstairs. 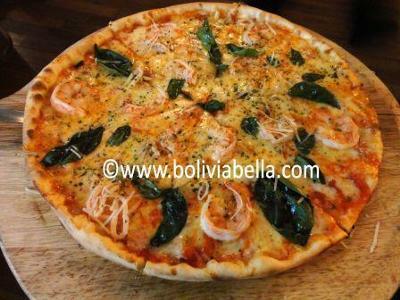 We tried the shrimp and basil pizza because it was unusual and it was very good, although the crust is very thin. This we accompanied with a Veneta salad (lettuce, pears, roquefort cheese and candied walnuts) which was delicious! The larger downstairs restaurant area is probably more comfortable as the tables upstairs are very tiny but it's obviously a well-like restaurant. People waited patiently outside in the cold for a table and it was full all night on a Tuesday night. 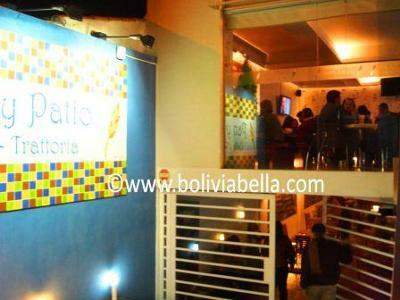 The restaurant also serves numerous entrees, soups and pasta dishes. We liked it. It's definitely worth a visit for dinner.